Detox: Is it for you? Detoxification is something that your body does naturally and continuously during your normal metabolic processes. many of these detox diets are short on nutrition and long on promises. Some supplements used along with detox diets may cause your body to detox too quickly, potentially harming your body. There isn't much scientific research done on detox diets, and no credible claims that they are healthy for you. Most detox diets use testimonials to sell the idea to others. It's not difficult to understand why people would have good things to say about these diets. If you're eating a poor diet of processed foods and refined sugar and then switch to a near-starvation diet, initially you might feel better and have more energy. But a sudden move like this might be too extreme for your body's well-being. If you fast long-term, you'll be short on protein and energy. Sure, you will lose weight, but that weight loss will be due to your body breaking down muscle protein along with stored fat to get the energy that it needs. Even though the number on the scale might be lower, you'll be left with a deficiency of protein and nutrients, which will lead to a negative disruption in the metabolic process, harming your body's cycle of calorie burning, healing, and repair. No matter what your diet consists of now, your body is already constantly detoxing itself through the everyday metabolic tasks of the liver, kidneys, colon, skin, blood, and lymphatic system. these organs help remove harmful chemicals from the body, flushing them out in waste material like urine or feces, But if a poor diet leads to deficiencies in certain minerals such as magnesium or calcium, the body will begin to hold on to toxic metals in their place. Calcium is replaced by lead, which primarily ends up in bone, disrupting the formation of red blood cells. too much lead can contribute to anemia, and lead to osteopenia and osteoporosis. Zinc is replaced by cadmium, which usually settles in the kidneys. Too much cadmium has been linked to peripheral neuropathy. Manganese is replaced by nickel, a carcinogen. magnesium will be replaced by aluminum, a metal that can cause neurochemical changes and can contribute to the development of Alzheimer's. How Can You Tell If You Need To Detox? With all the above information about your potential exposure to toxins, you might be thinking that a detoxification plan is absolutely necessary. Before jumping to that conclusion, take a look at how your body's excretory system is dealing with toxins. First, check your urination. Your urine should be a pale yellow, and you should be urinating about every two hours. If you aren't going that often, drink more water. We recommend about one quart of clean water per fifty pounds of body weight per day (not exceeding three quarts). The next thing to consider is your bowel movements. You should have at least one solid bowel movement per day. Natural fiber found in fruits, vegetables, beans, and whole grains can help bulk your stool. If you are eating too much meat and/or "white food" your digestion might be slowed down too much. Not only can this be uncomfortable, but it also inhibits the efficient excretion of toxins. If you are thinking about detoxing, don't take the decision lightly and don't simply follow a fad diet that could end up doing more harm than good. Detoxing can be dangerous for certain people. For instance, pregnant and nursing mothers should never detox. People with diabetes, anemia, or diseases of the liver, kidneys, or thyroid should always consult an expert healthcare provider before considering a detox program. Even if you don't know of any kidney or liver problems, it's better to be safe and check with a doctor first. Your kidneys and liver may only be functioning at 20% without showing any outside symptoms. Proper testing is needed first to determine your body's toxic burden and then discover how well your body is excreting those toxins. No one test can tell you anything definitively. 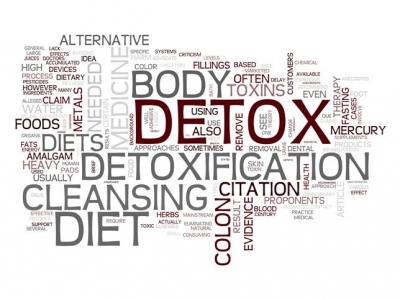 Call us today at 773.878.7330 to schedule an appointment to determine if detoxification is right for you. 1. Miller GT (2004), Sustaining the Earth, 6th edition. Thompson Learning, Inc. Pacific Grove, California. Chapter 9, Pages 211-216.via Wikipedia. 5. June Russell's Health Facts: Pesticides Facts, http://jrussellshealth.org/pestfacts.html (accessed April 09, 2016). 2. The information provided in this newsletter has not been evaluated by the FDA.